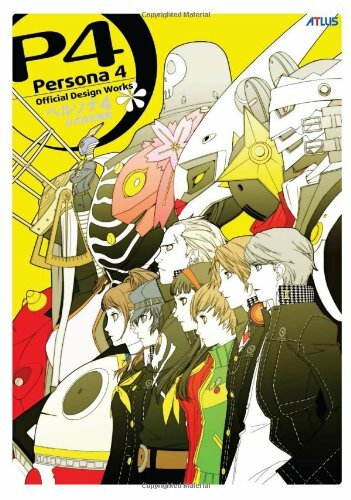 The Persona 4: Official Design Works cover is a glossy, thick stock covered with slick character art that oozes Soejima’s sense of style and art direction. Characters are displayed in profile, lined up and ready for a fight. 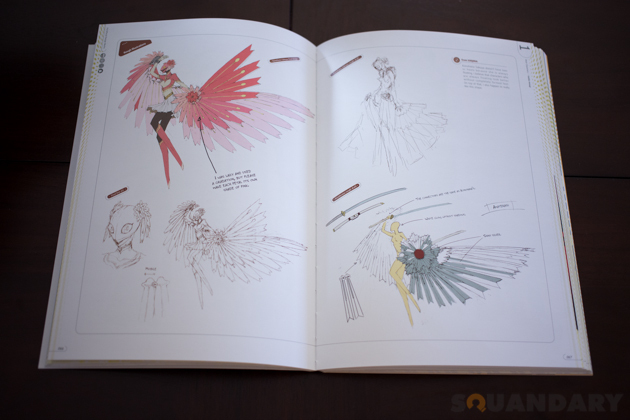 The back cover features a mix of game renders and rough pencils, printed in a mix of glossy and matte areas that highlight the art against the backdrop. 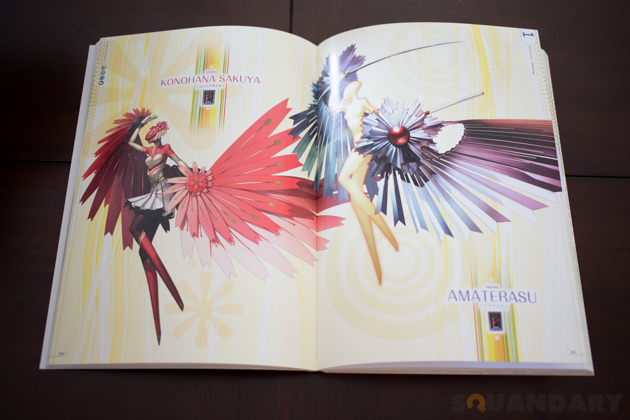 The use of this mix makes for a very cool effect on the front and back of the book. 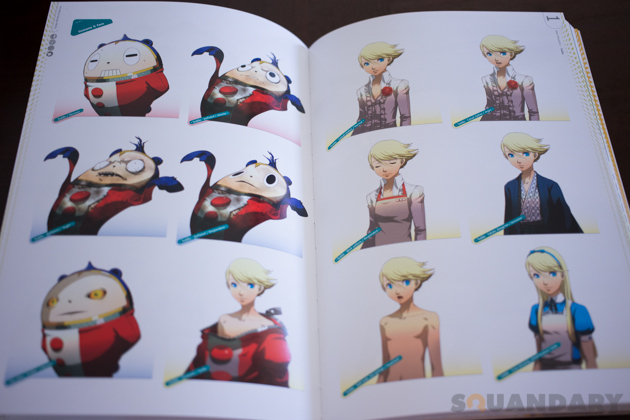 This is more of what you have come to expect from Udon art books. 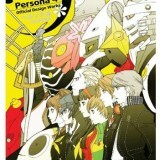 Thick paper stock, premium quality printing, and a wonderful collection of artwork that leaps off the pages. There are no corners cut on the quality of paper throughout, but I did notice a very noticeable crack that traverses the entire length of the spine after the first time I opened the book to the middle pages. I’m not sure there is a way to prevent this but it does mar the area of the book most widely seen on the bookshelf. 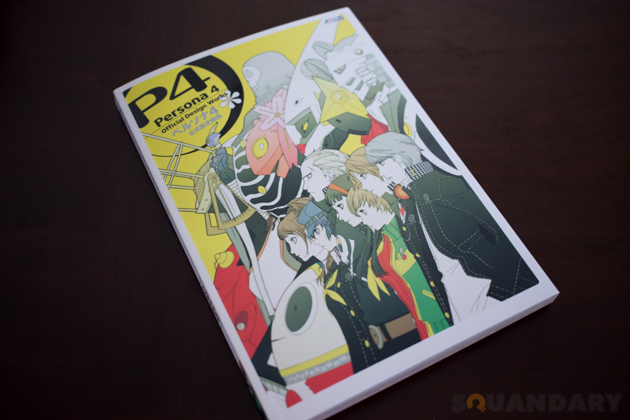 The design of Persona 4: Official Design Works is slick, modern, and has a fresh feel to it that gives it an energy you get from just flipping through the pages. 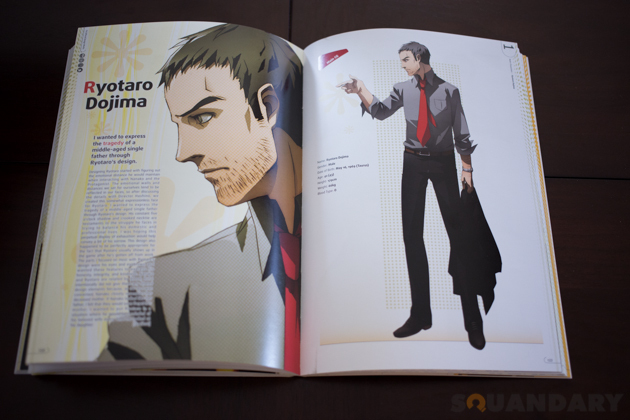 Bright colors and beautiful high-resolution art drowns any empty space on most pages. 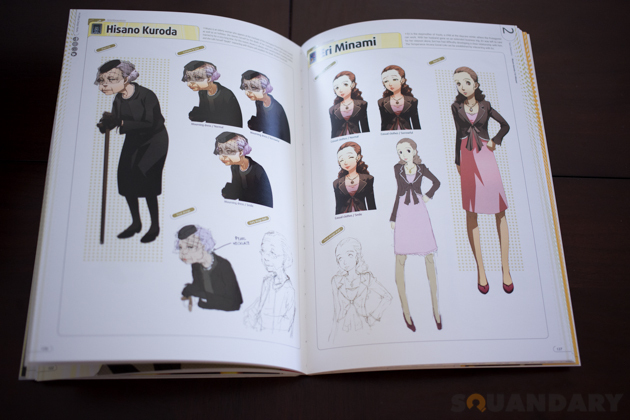 The pages that are dedicated for character study are laid out in a logical grid showing a variety of expressions and designs. 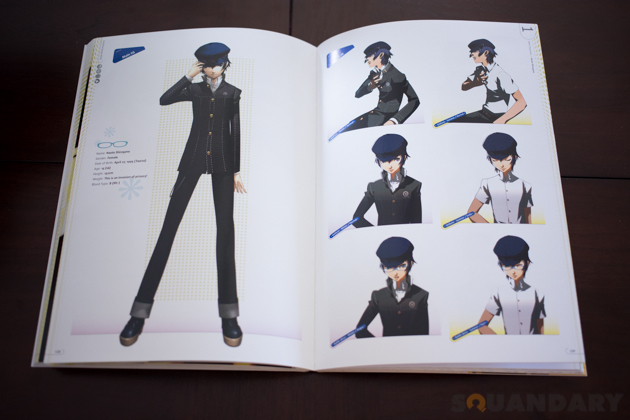 The book is laid out in broad chapters covering main characters, sub-characters, shadows, and extras including concept art, sketches, story boards, and an interview with Shigenori Soejima giving some insight into designing ‘cool’. At 192 pages, there is no shortage of content here, but there is definitely room for some more expansive background and environmental studies. 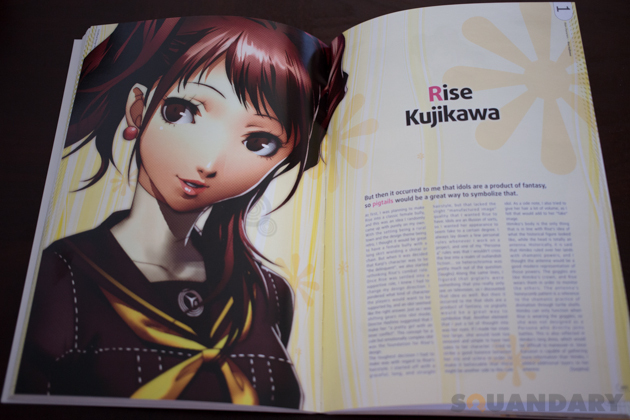 While rich with character art, leaving out one of the more impressive aspects of Persona 4 seems like a bit of a waste for such a wonderful art book. 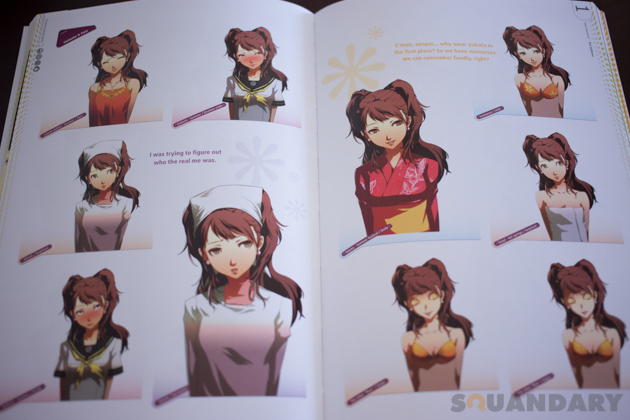 Honestly though, it almost makes up for it with the inclusion of male characters shown in ‘cross-dress’ since it truly seems to be part of the art process for Soejima. 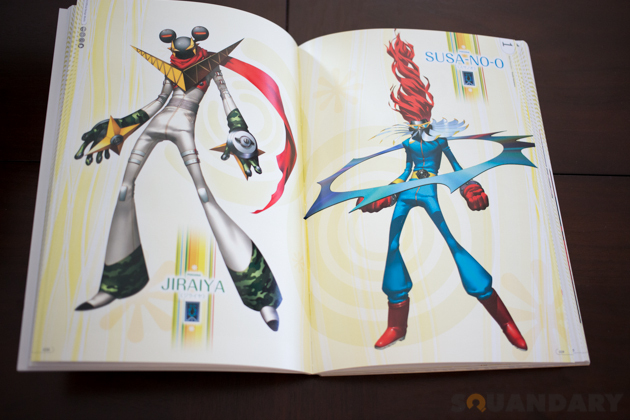 I find Udon’s pricing to be very fair considering the insanely good art they are able to fill their books with, so a suggested retail price of $39 is tough to argue with. 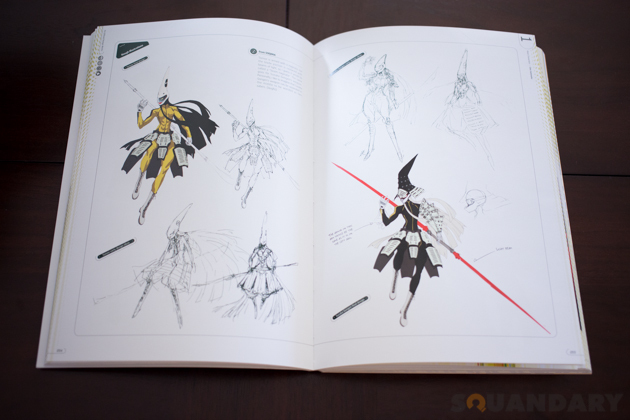 The beauty is that Amazon seems to disagree and consistently prices their art books around $26, which is an absolute steal for the content provided in Persona 4: Official Design Works.